Over the last few years counterfeit auto parts have been flooding the market. They can fool even the most experienced eyes because they often carry trademarks and packaging of trusted brands. Instead of meeting an automaker’s official standards, counterfeit parts are often dangerously inferior. One example of the problem occurred in July of 2012 when the Timken Company of Mississauga was contact by the RCMP about counterfeit bearings. At the time Canadian customs at Toronto’s Pearson International Airport had identified a full pallet of about 500 of what appeared to be Timken bearings as part of a shipment coming in from China. According to the Canadian Anti-Counterfeiting Network (CACN) counterfeiting is now responsible for billions of dollars in losses to the Canadian economy based on RCMP estimates, and it has been directly linked to organized crime and significant consumer health and safety concerns. Goods that are commonly counterfeited include pharmaceutical products, electrical products (both household and industrial), software, movies, music, toys, food, wine, personal care products, automobile parts and luxury goods. When it comes to counterfeit automotive parts, the results can be inconvenience at best, and as bad as catastrophic failure, an accident, or injury. Parts seized by authorities have included maintenance items such as oil and air filters and spark plugs, and can quickly get into dangerous territory. Critical safety equipment including brake components, steering linkages, suspension parts, and engine parts are no place to take risks, and suspect parts have been identified in all of those categories. The parts that are specifically designed for your vehicle are important in keeping you and your occupants safe. How do you protect your vehicle, yourself, and your loved ones? One of the best ways is to use your dealer’s service department. 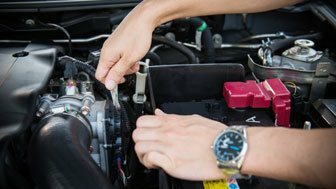 Not only can you expect the shelves of its Parts Department to be stocked with the most trustworthy stock, but the factory-trained technicians will know the ins and outs of your specific model. They work on vehicles like yours every single day and know exactly what needs to be done. Having a finely-tuned sense of caution can be helpful, as well. Carefully investigate offers which seem too good to be true. Considering that your vehicle is something you use almost every day, and you trust it to get you and your passengers wherever you need to go safely, it only makes sense to be vigilant. With the support of your car’s manufacturer, the service department at your dealership is the best way to ensure you’re getting exactly what you paid for. Stop by today to find out if there are any specials going on and make sure your vehicle is being fitted with all the right parts. And to learn more about the Canadian Anti-Counterfeiting Network and the work they do,you can visit their website. Or find out more about the Hyundai Advantage from the Milton Hyundai Parts Department.